The European bison: king of the forest or refugee species? In the first half of the 19th century the European bison (Bison bonasus) existed in good numbers in the Białowieża forest in Poland. Shortly before the outbreak of the First World War the population was estimated at 727. However, the outbreak of war, and the following German invasion and eventual occupation of Poland, saw the bison population drastically reduced by hunting to feed the hungry German troops. The destruction of vital bison habitat also placed severe pressure on dwindling bison numbers. A German stocktake, conducted in 1917, revealed that there were just 121 bison left in the forest. Just two years later, the European bison was declared extinct in the wild when the last individual was killed in the Białowieża forest. The European bison, Europe’s largest and heaviest land mammal, is currently enjoying a comeback thanks to the implementation of several reintroduction programmes throughout Europe. The first of these was performed in the Białowieża forest, in Poland between 1952 and 1966 when 38 individual bison were released. It is one of those rarest of things in conservation; a good news story. In 2014 the population in the Białowieża forest was estimated to be 522. As far as people remember, bison in Poland have always lived in the forest, and survive with the help of supplementary feeding throughout the harsh winter months. This contrasts with their American cousin, the American bison (Bison bison), who are symbolic animals of the great American grassland plains. This contrast led one research team to conduct a scientific study to try and discover if the European bison has always been king of the forests, or if it resides in the safety of the forest it had nowhere else left to go. Dr Hab. Rafał Kowalczyk from the Mammal Research Institute Polish Academy of Sciences in Białowieża and Prof. Hervé Bocherens from the University of Tübingen spearheaded a team of researchers who have studied some of the oldest (10,000 – 12,000 years old) European preserved bison bones to try and ascertain its diet, which would hopefully unravel clues as to its preferred habitat in the age of the Holocene. Previous studies showed that the European bison is a species with morphological adaptations to open, grassland habitats, such as a wide muzzle and teeth designed for wear and tear. This led Kowalczyk to question why the forest habitats were the last environments where bison survived before extinction in the wild at the beginning of the 20th century. Why had the bison – apparently a grass grazer or mixed feeder – survived in forest habitats? “Over ten years ago, when I started my research on the bison, I found that most large herbivores of a similar size to bison are attached to different habitats, than just the forest habitats, currently occupied by bison in Białowieża, Poland”, explained Dr Hab. Rafał Kowalczyk. “For example, the close relative of European bison, the American bison, generally occurs in semi-open grassland habitats such as prairies, plains and river valleys”. Kowalczyk and his colleagues believe that a combination of replacement of open grassland by forest cover after the last postglacial period, and increasing human pressure, forced bison into forests as a refuge. Kowalczyk was motivated to invite leading specialists in Europe in this field, Professor Herve Bocherens, from Germany, and Dr Gildas Merceron, from France, to conduct the project on bison history. Together, they hoped to uncover whether stable isotope analysis of historical bone material and teeth microwear may allow them to reveal clues about the historical pattern of habitat use and diet of European bison. Stable isotopes were first used to research the foraging ecology of animals in the 1970s and involve the identification and analysis of chemical elements, compounds, and stable isotopes to determine diet, trophic level and subsistence of a given species. As Rafał and his team expected, their research found that bison were likely to be open habitat dwellers in the early Holocene, but interestingly, they had a mixed diet. It contained both grassy vegetation and the shoots of trees and shrubs, and also lichens. However, he was surprised when they analysed other large herbivores bones, such as aurochs, bison and elk that shared the same habitat, to find that bison avoided inter-specific competition by utilising the same habitat, but having a different diet. Rafał, and his PhD student, Emilia Hofman-Kamińska, based at the Mammal Research Institute in Bialowieza want to go deeper into the evolutionary history of bison. Emilia is researching teeth microwear analysis, enabling detailed reconstruction of the diet, and giving insights into spatio-temporal changes of bison habitat use during the Holocene. Now they know what the bison’s diet and habitat used to be, they want to look at when this changed, and why. Dr Hab. 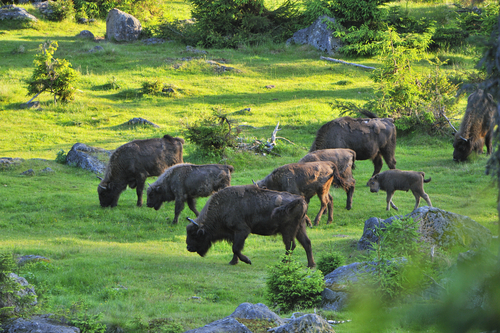 Rafał Kowalczyk predicts that this finding is important for the conservation and management of modern populations of bison that that have been established in forest environments. 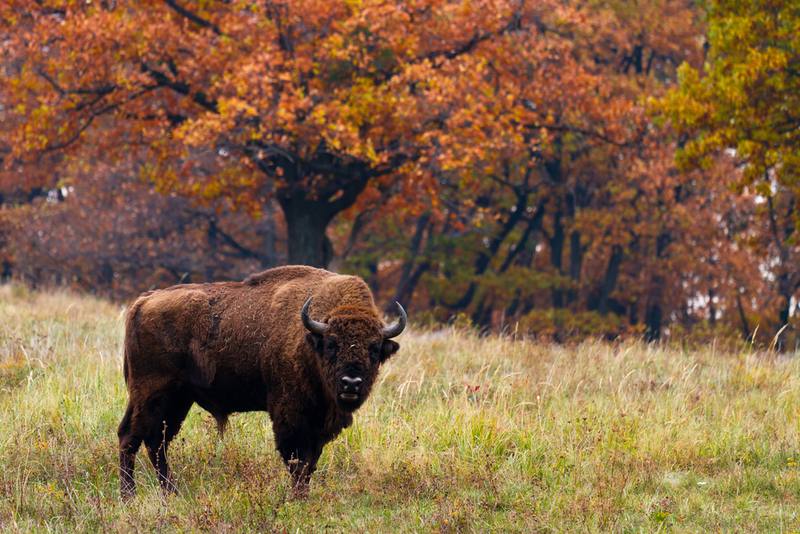 When asked whether he envisaged a time when the Bialowieza bison population could survive without supplementary feeding, he answered, “The study shows that probably optimal habitat for a bison is mixed habitat, mosaic of meadows and woodlands…Such habitats may ensure bison survival without supplementary feeding”. The wisent project, in Kraansvlak, Netherlands, supports this idea. The project involved introducing a herd of bison into a large fenced off area of mosaic habitats that were predominantly meadowland. The herd is now thriving without the need for human supplementary feeding. Rafał hopes that his team’s findings will influence fresh approaches to bison reintroduction projects, increasing the emblematic, large ungulate’s ability to sustain itself and survive into the future, after such an unstable history. Previous ArticleDo you have an opinion? Your jumping script is caused by the flashing images is a real pain.